NuMedica ParasideX is a powerful herbal formula designed to enhance digestion by promoting a healthy intestinal microbial environment. Our intestines are colonized by what many of us refer to as "gut microflora" or healthy intestinal bacteria. These colonies of microflora populate the gastrointestinal system where they enhance the digestive process. Often, these populations can shift or become unbalanced. The result is indigestion and its unpleasant symptoms. By taking an herbal supplement like NuMedica ParasideX, you can safeguard your gut microflora so that it can do its job and help keep your digestive tract functioning optimally. Studies suggest that our gastrointestinal tract is an incredibly complex ecosystem. While these microbes play an important role in healthy digestion, they also affect many other areas of our body like our brain, heart, skin, and even our weight. Beneficial bacteria, known as probiotics, combat disease-causing bacteria and reduce inflammation. 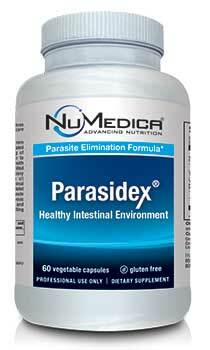 NuMedica ParasideX provides your gastrointestinal system with optimum support where healthy bacteria can thrive. NuMedica ParasideX contains natural ingredients like bromelain, peptidase, ginger extract, and gentian root, which are known to support the digestive system. Bromelain, found naturally in pineapples, contains enzymes that help break down proteins. Bromelain is also excellent at reducing inflammation. Peptidase is another enzyme this is ideal for breaking down proteins and warding off inflammation. It also helps support immune system function. Ginger has long been used as a remedy against indigestion and it can even help dispel uncomfortable stomach gas. The other natural ingredients in NuMedica ParasideX work in a similar fashion-to support digestion and healthy gut microflora. Free of: Milk, eggs, fish, shellfish, wheat, tree nuts, peanuts, soy.